Here are 23 fun and educational apple art projects for your students in preschool through second grade. Worms just LOVE apples! I go to Wal-Mart and buy fishing worms (without hooks, very cheap) and we use red, green, and yellow paint to paint with the worms on apple shapes. It’s always a hit with the kids. When making apple prints, if you cut a notch on either side of the stem so children can use them as finger grips. If you make it look like this it works really well ]0[ Make the notches square so it is easier to hold. Color a paper plate red to be the “apple” and add a stem and leaves on top….then cut a small hole in the apple. Draw a face on the child’s finger and let the child put his/her finger through the hole. The child’s finger is the worm. When using apples to make an apple print. Pierce the apple with a fork. The students can pick up the apples with the fork to dip in the paint and avoid getting paint all over their hands and clothes. slice apples sideways and place in a lemon juice and water mixture for a few minutes. Moisten rigatoni pasta with water and then roll in cinnamon to coat. Using plastic needles and yarn, have children alternately string the apples and noodles. Add a country fabric bow to the top and dry near a sunny window. They look and smell great! Family Apple Tree: Cut out apple shapes from white construction paper; then have the children finger paint with the color red. When dry; put the child’s family picture on the apple. I made a tree out of cardboard; then the kids painted it brown; when it was dry; To make it look like a real apple tree I cut out some green paper a cloud-like shape and taped it on the tree; then I taped each child’s apple on the tree. I had it up for our Open House in October. The kids really got a kick out of it. They showed their parents at Open House and were very proud. Also, include teacher’s family picture. Apple Rolling. You will need one red apple, one green apple, one yellow apple, three medium bowls with a small amount of red, green, and yellow paint (one color in each bowl), white construction paper, and a box or a bin large enough to hold the paper on the bottom. 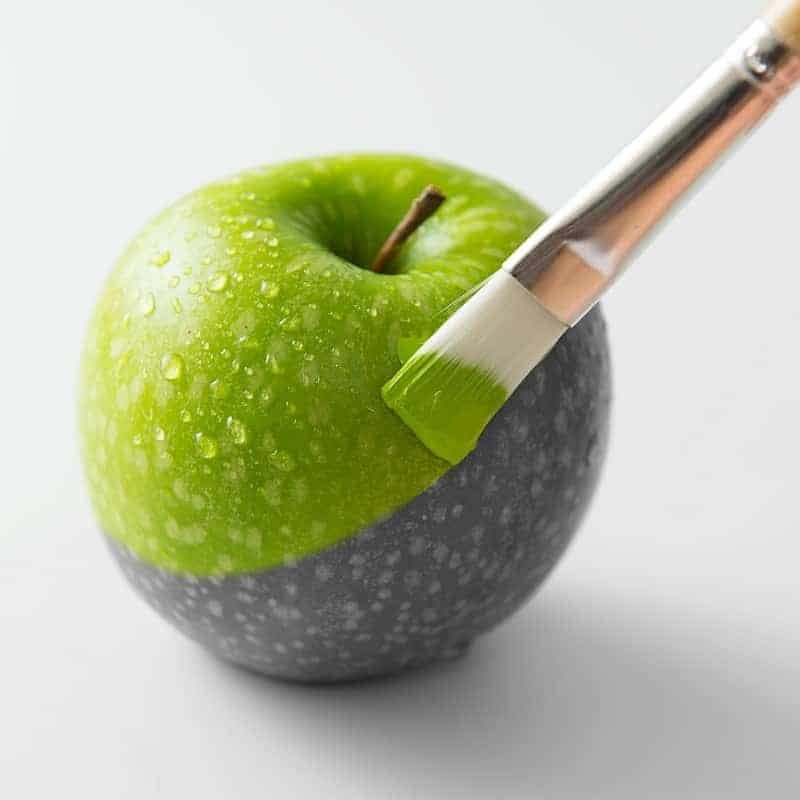 Place each apple in the bowl with the corresponding color of paint. After placing the paper in the box or bin have the children place the paint dipped apples (one at a time) in the box or bin. Let the children move the box from side to side or shake the bin to get the paint dipped apple to move around. Use all three colors and the apples will drag the paint, creating a beautiful design on the paper. The kids love this. I also sing this made up a song with the kids while they are creating. To the tune of Row Row Row Your Boat. Roll roll rolls the apple, Watch the colors blend, Make the colors move around, And then we’ll do it again! Candy Apples – Cut a small slice off the bottom of a 3 inch Styrofoam ball so that it will sit flat. Insert a craft stick on top. Paint with red paint mixed with a small amount of glue. Sprinkle top with a glitter of real sprinkles. I like using large paint brushes. Great for classes with food allergies! I cut out construction paper apples (all apple colors) and then let the kids glue on buttons that are apple colors, looks really cute. I then let them paste on the stem with leaves and it’s all done! Duplicate a tree photograph or outline on white paper. Have children color or sponge paint trunk and branches brown, and tree leaves and grass below the tree green. For stability, glue colored sheet onto larger construction paper or cardboard as a mat. Using white glue, glue approximately (depending on size) 7 crab apples onto tree branches. Let dry thoroughly. For leaves, shred several sheets of green paper through a cross-cut paper shredder. Crush cuttings by hand rolling into a ball and then fluff cuttings lose. Apply white glue to leaf areas of tree and push green crushed cuttings into glue, keeping apples clear. Let dry thoroughly. Shake off excess cuttings and trim tree shape with scissors if necessary. If desired, glue a “fallen” apple on the ground under the tree. Depending on the condition of crab apples, the finished project will last several days.